So, what if it does not work out the way Google and its partners envision it to be? What will Google do then? Perhaps, we might actually see the fabled gPhone that was making it way across the Internet even before the iPhone was released. (See here for mockups) After all, Google did say it would reserve the rights to develop and release its own phones. That was always something that stuck with them. For Google, there is a certain vision they have and they can't expect their partners to share every aspect of it. In the end, Android will have a brighter future if the alliance thrives than having Google go at it alone. And even if HTC and others abandoned Android and move onto Symbian or LiMo (two other open-source mobile platforms), it does not mean Android will be relegated a second class platform. Google Search and its web apps has generated enough good-will for a gPhone to have a good shot at doing well on the market. One issue that may plague Android, be it gPhone or a HTC phone, is software and developer support. Accoring to Google, it is only 80% finished. It may be running into issues with developers. Recently, an e-mail mistakenly made public revealed Google released a newer version of the SDK to a limited to 50 privileged developers who won the first round of the Android Challenge, certainly not the way most would chose to win support. Furthermore, there have also been rumblings of dissatisfaction. Look at what Apple is doing with the App Store and the iPhone quality issues. The mobile market is new to both companies and both are likely to stumble a bit here and there. As mobile gadget lovers go, we hope the stumble does not become a fall that they cannot recover from. The iPhone has received rave reviews from critics and owners despite the MobileMe issue. I believe it is because MobileMe an added value to the iPhone and not necessary to fully take advantage of the iPhone. For Google, they want Android to be more than just an OS for a smartphone. It is meant to be what OS X means for the iPhone, a mobile platform. 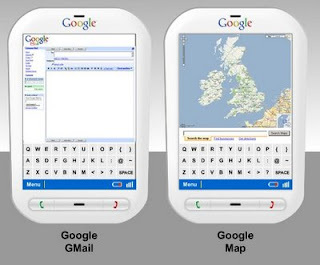 And if it means Google release the "gPhone" to make their vision come true, then that is just what they have to do.